Are you one of the 500 million? I’m sure you’re probably remember all the heck that broke loose when the app was first released. There was all sorts of hoopla going on and people sharing links to articles about how the app could access everything (okay, maybe that’s a bit dramatic) on your phone if you installed it. 500 Million Facebook Messenger Users!!! 500 million. Holy crap! That’s a whole lot of people. I guess I didn’t realize just how big this social media platform was. I mean I knew it was big but dang 500 million – I can’t even wrap my brain around that number! While Facebook Messenger has previously passed the 500 million downloads milestone, the fact that it now claims this many people are actively using it, suggests that the original shift may not have been as unpopular as first seemed. Either that, or many folks simply rely too much on Facebook to communicate with friends to resist for long. Alright that’s enough rambling from me. Go check out the article for yourself: Facebook reveals 500 million people are now using Messenger each month. And if you’re interested you can watch the Q&A session with Mark Zuckerberg now too. That link is: Mark Zuckerberg’s AMA: Messaging app, his favorite unreleased features and Social Network movie. I’m curious – are you one of the oodles and oodles of people using Facebook Messenger? Hi Tishia, Yes I use it. It’s how I keep in touch with family and friends, arrange get-togethers and lots of fun things. It just seemed to happen overnight that I started using it and it was no big deal. Does this mean that you are not using it? Hi Charmaine! Thanks for taking the time to comment – I appreciate it. No, I do not use the messenger app. Had it installed very briefly and then uninstalled it. The decision to uninstall? Friends and family text me so it was never needed for them to get a hold of me. And for business purposes – about only time I was on my phone (Facebook) was weekends and those are my down times meaning I don’t check emails, etc. so I made the decision to uninstall the app because I wanted to be “unplugged” work wise on weekends and that meant ditching the app. Most of my clients, potential clients know not to contact me via FB because it’s not a reliable way to reach me – when I’m busy there are times I go days without being able to even get on FB. 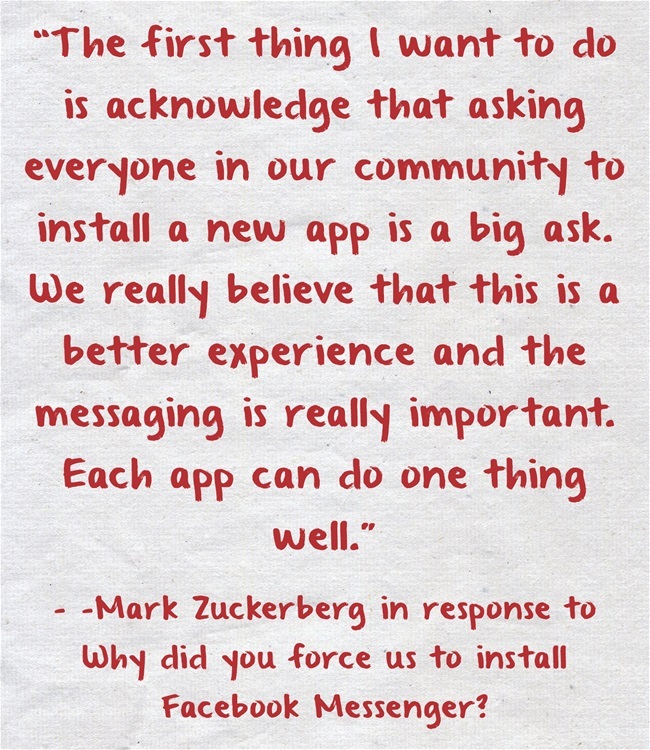 So for me personally I don’t need the messenger app.